At Body & Mind Fitness, all Personal Training clients, as well as participants in our Body Transformation Bootcamps, receive a weekly nutrition and lifestyle diary. 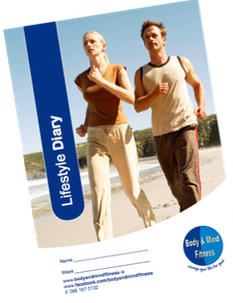 The purpose behind the diary is to allow the individual to record everything that is likely to have a direct effect on their body’s ability to burn fat and/or build muscle: Diet, Exercise, Sleep and Stress patterns. This record then gives me a more accurate picture of what’s happening during the 165+ hours per week when the client is not training with me. Today and over the course of the next number of weeks, I’m going to discuss some of the most common mistakes I see from the diaries. By eliminating or at least reducing these items, you will be far more successful in reaching your health and fitness goals. By far the biggest problem is not actually keeping a diary! Before the 1st training session each week, clients have a weigh-in and are supposed to hand in their diary from the previous week. However this doesn’t always happen, with excuses ranging from “I left it in the car/at home/at work” to “the dog/kids ate it”. Unfortunately, those who return the least amount of diaries tend to get the worst results, regardless of how hard they may have worked in class. One study suggests that the simple act of writing down what’s being eaten makes people more inclined to eat fewer calories (1). They also have a tendency to make better food choices. This makes sense because many people eat while their attention is elsewhere. It’s far too easy to over-eat while watching TV or sitting at a computer and letting your hands and mouth go on automatic pilot. It works best if you keep your diary with you at all times, and record your meals as soon as you’ve eaten. Trying to remember what you had for lunch 6 days ago does not have quite the same effect. So, if you’re serious about losing body fat, keeping a regular accurate food and lifestyle diary will bring awareness and structure to your diet and help you reach your goal. 1. Kaiser Permanente (2008, July 8). Keeping A Food Diary Doubles Diet Weight Loss, Study Suggests. ScienceDaily.